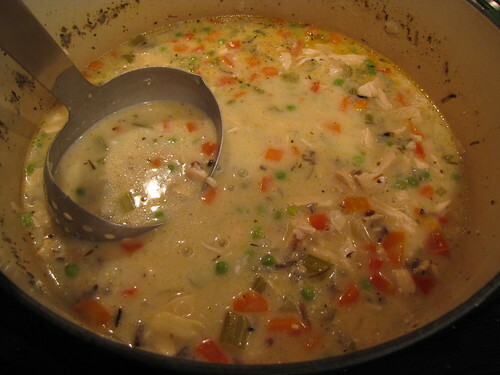 Cream of Chicken & Wild Rice Soup. Otherwise known as The State Soup of Minnesota! Do they have things like State Soups as we do State Songs and State Birds? If not, we should. I’ve already decided that Beer Cheese Soup is the official State Soup of Wisconsin. Since both the recipe for Steak Soup and I hail from Kansas City, I vote we call that one for the State of Missouri. Florida? How about Gazpacho – either traditional tomato or funky Watermelon. 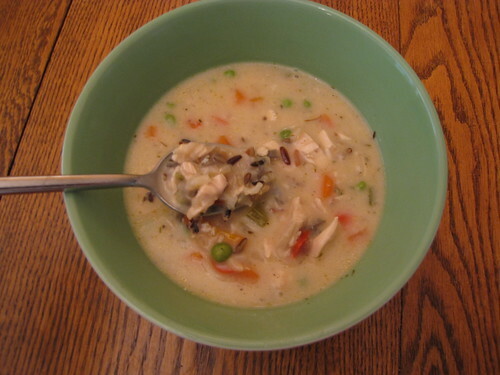 Anyway, I think there can be no doubt, no debate, no argument that if you’ve ever stepped foot in Minnesota, you’ve probably encountered Cream of Chicken & Wild Rice Soup. Wild Rice is a Minnesota thing. People buy bags of it at the airport to take home as souvenirs. Everyone I know in Minnesota (unless they are vegan) makes some version of this soup. Chicken Breast, Chicken Broth, Onion, Celery, Carrots, Red Bell Pepper, Garlic, Wild Rice/Rice Blend, Frozen Peas, Butter, Heavy Cream, Bay Leaves, Rosemary, Thyme, Rubbed Sage, Sherry (optional), Salt & Pepper. 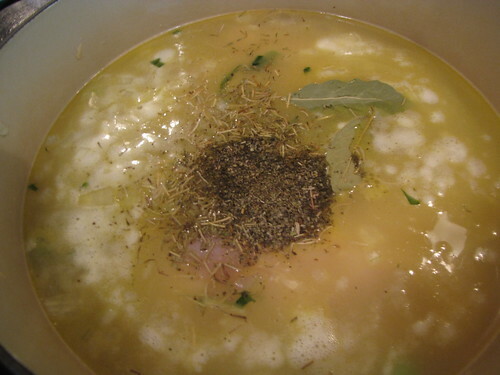 If you have Homemade Chicken Stock or Broth, by all means use it. 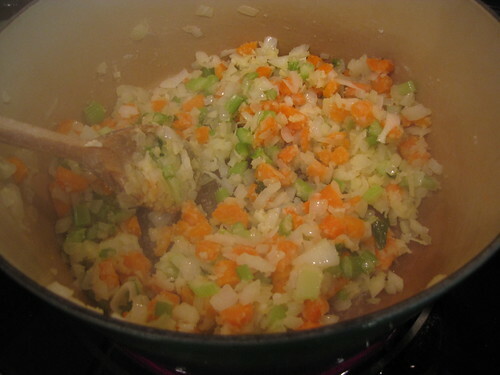 However, this was a weeknight and I was aiming for using up things in the pantry and also one and only one pot to wash.
We start with the soup basics, chop 1 large onion, 3 ribs of celery, and 4 carrots. You should also chop up that red bell pepper but I forgot and had to add it later. Melt ¼ cup butter (or olive oil) in a large soup pot over medium high heat. 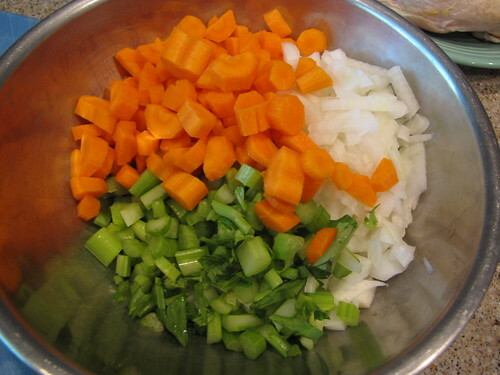 Add the chopped vegetables and cook until tender but not browned, 5-7 minutes. 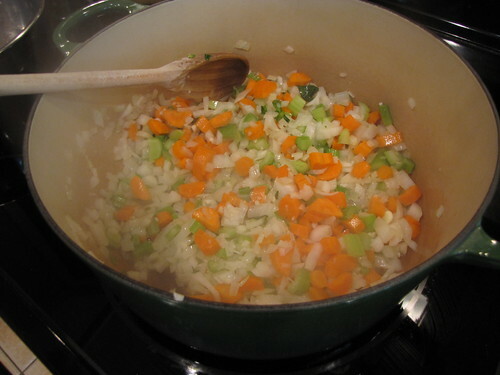 Stir the flour into the veggies until it is thick and pasty. Add 8 cups of chicken broth and stir to combine. 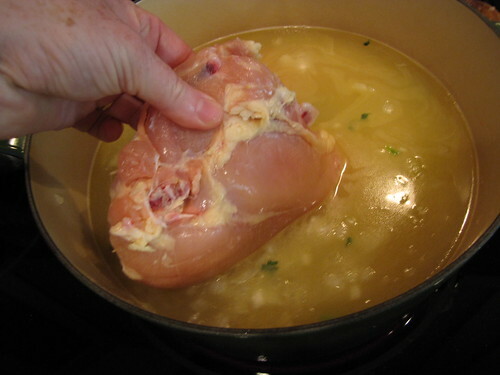 Remove the skin from 2 chicken breast halves and add them to the pot. Season with 2 bay leaves, 1 teaspoon dried rosemary, 1 teaspoon rubbed sage (not powdered), ½ teaspoon dried thyme, and 1 teaspoon each salt & pepper. Bring the pot to a boil, reduce the heat to low, cover and simmer for 30 minutes or until the chicken is cooked through. 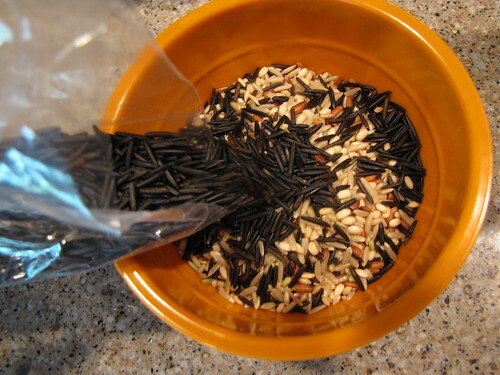 Meanwhile, let’s talk about wild rice. 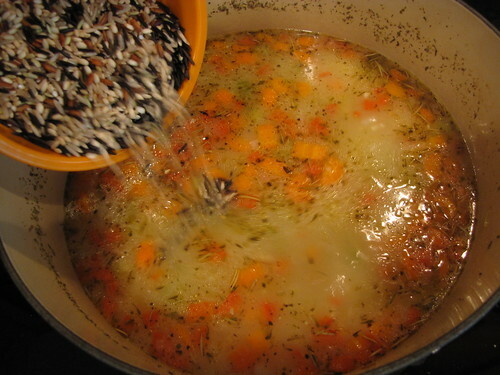 Most people traditionally make this soup just with the long, crunchy, dark wild rice but I also like the flavor and softer texture of a wild rice blend. This one has a couple varieties of brown rice in addition to the long grain wild rice. 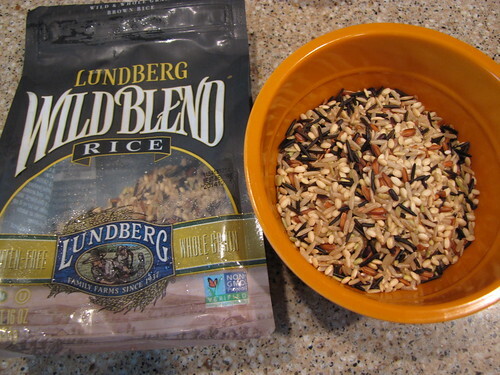 I used ½ cup of the rice blend and then supplemented it with an additional ¼ cup of traditional long grain, wild rice. When the chicken has cooked through, remove it to a plate to cool and add the rice mixture. 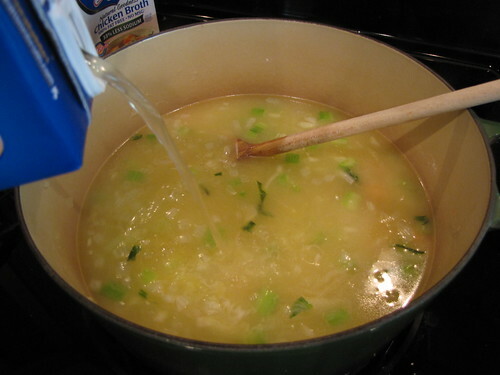 Bring the pot back up to a boil if needed, reduce the heat to low, and simmer for 20-30 minutes more or until the rice is tender. 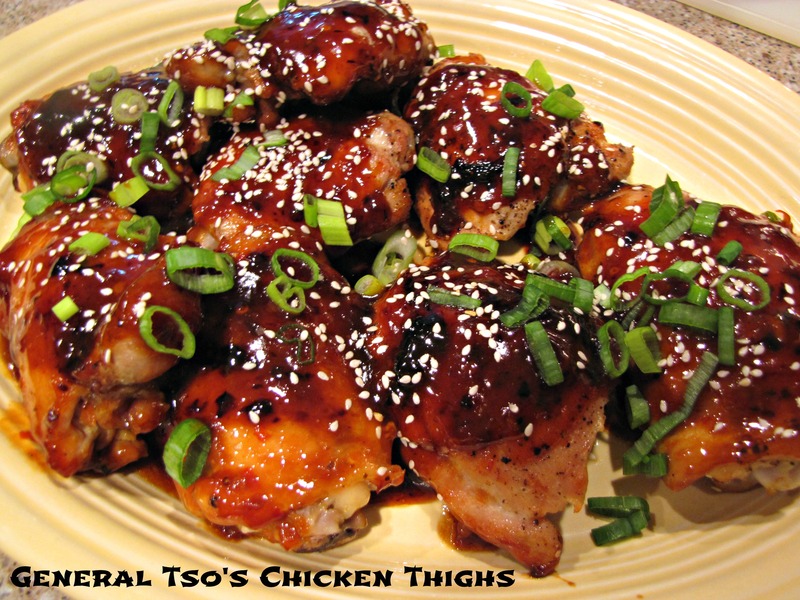 When the chicken is cool, remove the meat from the bones and chop or shred it into small pieces. 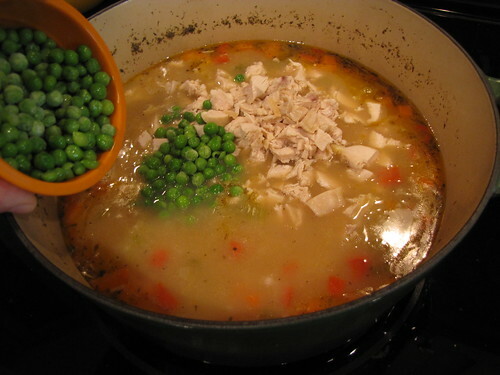 Add the chicken and 1 cup of (defrosted) frozen peas. You could stop here and have a very good, broth soup. However, we promised creamy. Add ½ cup of heavy cream and then if you want a little more flavor, add 2-3 Tablespoons of dry sherry. 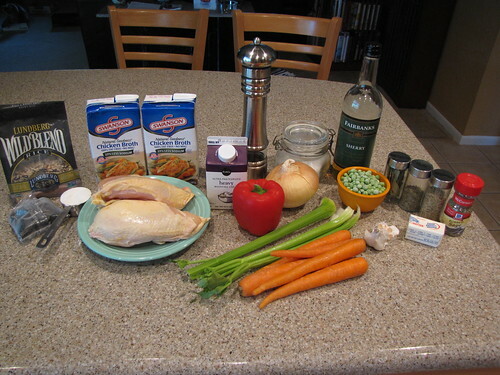 The sherry is optional but I really like its flavor with the chicken and cream. Heat the soup on low until you are ready to eat. 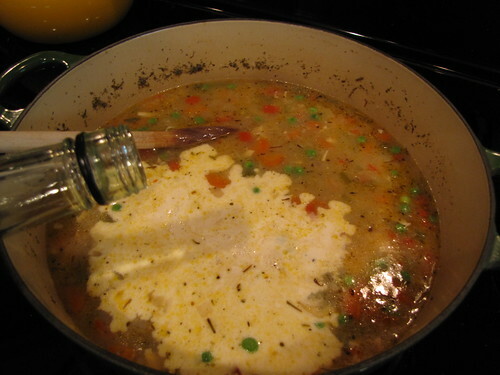 It is best if the soup does not continue to boil once you add the cream. 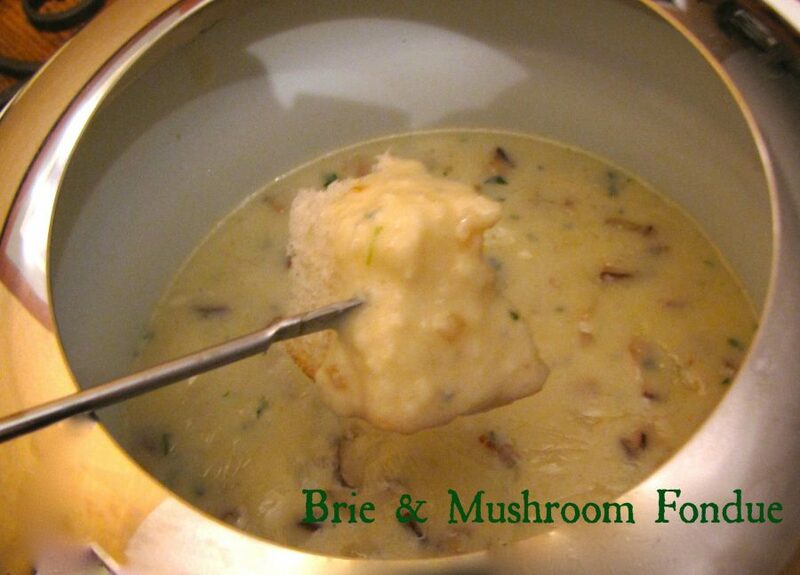 Season to taste with salt & pepper and ladle it into bowls! 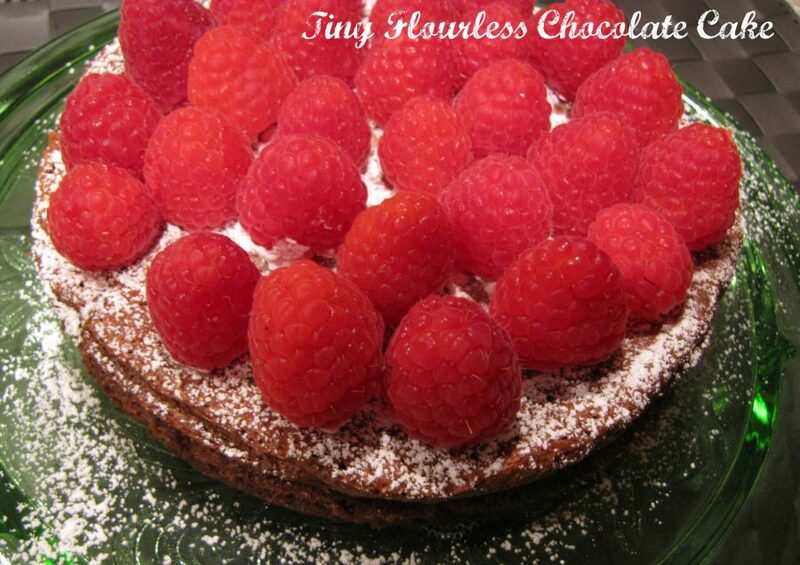 I was thinking that it was almost too late in the season to post this recipe but apparently today, April 16, they are having snow up north! My little niece who lives in northern Wisconsin went outside yesterday, saw the new snow and declared, “Mommy, it’s Christmas!” So, soup it is! PS. Speaking of Christmas, keep this recipe in mind when you’re trying to decide what to do with your leftover holiday turkey! I don’t know about soups, but Utah has a State Cooking Pot, the Dutch oven. I learned that from a 5th grader! I approve of the Dutch oven as a state pot! I’m laughing at your state soup declarations! I love soup any time of year…especially when it is snowing outside. HA. 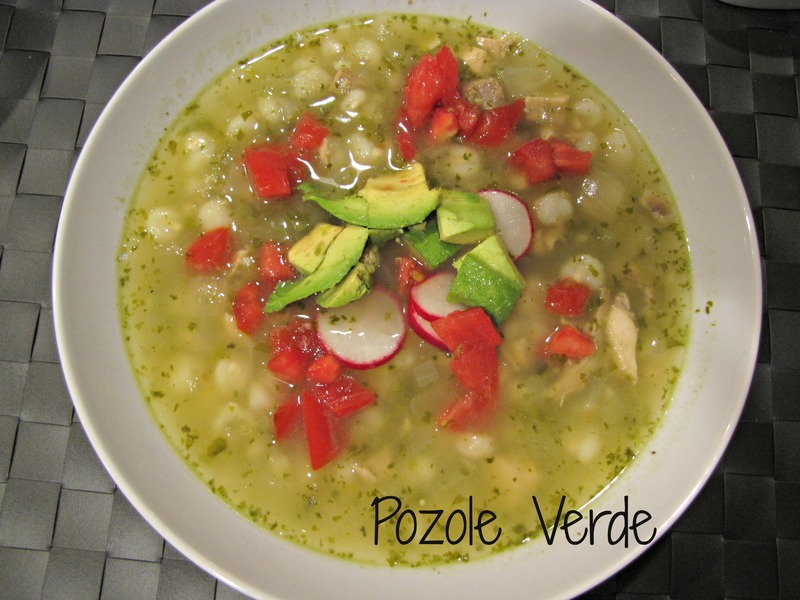 This looks delish….and would be great as a meal with leftover turkey. But really….we never seem to have any leftovers.